is a ministry to the communities of Jackson City & County. • in our community by connecting needs with resources. • for churches by being a point of contact with the community. • for our neighbors by being a resource center and telling them about Jesus. • All people matter to God. • We welcome all God brings us. • Everyone has value and something to give. • We ask God for direction every inch. • This will only work if God is the Owner/Leader. • We recognize that we are in a spiritual battle and prayer is the answer. • The Bible is real Truth. • There is one God in three parts: Father, Son, Holy Spirit. • Jesus was really born of a virgin, died on a cross for our sins and rose again. • There is a real heaven for those who follow Him. • There is a real hell for those who don't. or Click Here for easy-to-use on-line contact form. We are always blessed to hear from you. Please take a moment and write to us using our contact form. Your information will be kept private and never sold or shared. Please inquire in confidence and with no obligation. 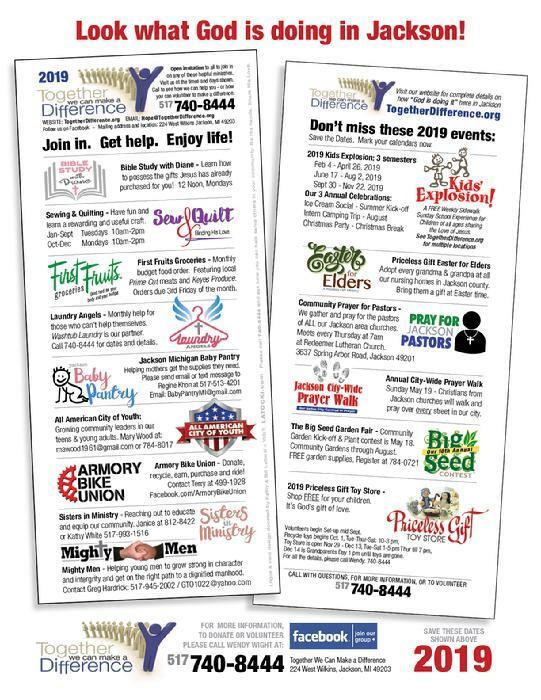 Community Gardens – “The Big Seed” - Networking people interested in gardening, and promoting gardening as a way for Jackson citizens to help provide for their own food needs. Annual Garden Giveaway providing portable or small gardens to families and a contest for the biggest vegetable plant the Saturday before Memorial Day. Baby Quilts – Providing quilts for the community baby showers, area shelters, and thru the Priceless Gift Toy Store. Helps young mothers know they are loved and supported. Priceless Gift Easter – Connecting Jackson’s Children with the 1,700 residents who live in our local nursing homes hoping to grow long lasting relationships between a child and a senior. The children make art at Easter time and deliver the gifts themselves. City Wide Prayer Walk - Join us annually in May to walk each block in our city asking God to bless and heal our land. Watch what God will do when the bride of Christ unites with one purpose. Priceless Gift Toy Store – Serving several thousand Jackson children each Christmas with recycled, home-made, and new toys - plus hundreds of gift bags of personal care items. This is one of our most effective annual outreaches to our city. Each year it grows tremendously - the need is there. So is Jesus in every detail, large or small. Made possible because of volunteers and partnerships with St. Vincent DePaul and more then 100 other business, schools and churches. Visit: svdpjackson.com Dave Kemler: dkemler@svdpjackson.com 517-784-0609 CLICK HERE to go to the Priceless Gift Toy Store information page. Bible Study - One Year Bible Diane Merritt helps bring God's Word to life as we study, and encourage each other to read through the Bible daily. We share lunch together, and pray for each other. Join us Wednesdays @ noon at 224 West Wilkins Street. Little Mama's Clothing Store – Provides elementary age children with a new or gently used clothing. Parents can shop by appointment - each item is only 25¢ Call Wendy at 740-8444. Food Pantry Partners – Christ’s Kingdom Ministries food pantry has partnered with us to provide food for those in need. We have worked together at Thanksgiving and Christmas to provide holiday meal boxes to Jackson’s financially hurting families. We do this in the Love of Christ. Laundry Angels – Help a neighbor with laundry service for 1 month. A single mom with more kids then money and no car, or someone who is very ill, and has no family close. See for yourself what a difference this small act of kindness means for a struggling family! Jackson Missionary Openings – Help the Together We Can Make a Difference ministry team continue to grow by financially supporting new missionaries working full time with us right here in Jackson County. Missionaries to Jackson raise their own support from family, friends, and local churches and businesses. Your monthly support adds up to help in a major way. Business Training – Help Together We Can Make a Difference to develop an opportunity for our residents to be retrained, break the welfare cycle, and run a small business. 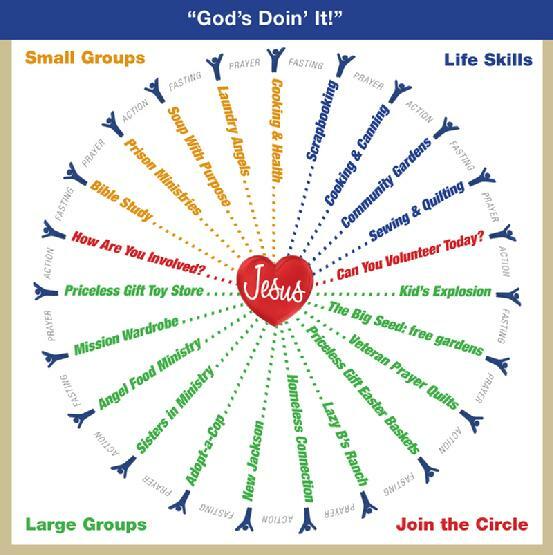 Use proven ideas from Junior Achievement, and Jesus Himself, to teach a new way of thinking and self support. Discover Your Passion – Everyone can do something. What did God have in mind when He created you? Are you busy doing it? Do you need help getting started? Everybody can do something to better themselves. We train and encourage the kind of personal growth that opens a new life for people. What is God calling you to do or help with? Feel free to call and chat at anytime about your ideas and dreams. We will pray with you and ask God to lead you. Together: We can help so many. volunteers, friends and supporters, like you. All information shown is being currently updated and subject to change. If you see something wrong or missing then email us and we will fix it. Together We Can Make a Difference is a 501c3 non-profit organization based in Jackson, Michigan. It is always reaching out with the Love of Jesus to help others and help them to get to know the Father's Great Love.